Growing up, we at H&O were always taught that a clean bucket is a happy bucket (we really do eat, breath and sleep buckets). No matter what you are using a bucket for, good practice dictates that you keep it clean and ready to go. This is especially true if you are using a bucket for food preparation. 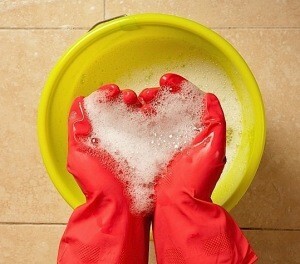 To retain a buckets integrity and cleanliness, it’s also a good idea to only use natural solutions when cleaning. Nasty chemicals make cleaning plastics that little bit more dangerous and way more expensive, especially when you probably have stocks of natural cleaners in your kitchen cupboard. Fortunately, we were also taught the natural alternatives for cleaning buckets – and far from being old-wives tales, these homemade cleaning products really do work. Give them a try and let us know how you get on! The first and most natural cleaning method is also the easiest; just give your bucket a rinse with cold water. If a liquids-container has been left for an extended period of time then the liquid can leach into the material and leave it with that unsavoury plastic smell. Fear not though, because a quick soak with a garden hose, or better yet, a power washer will soon strip the odour right off. Using cold water rather than warm and leaving your bucket to air outside for a while afterwards can work wonders. Try it, you might just surprise yourself. If your bucket stink is too stubborn for just water then you might try using a mild acid or alkaline solution. This doesn’t mean you need to break out the safety goggles and Bunsen burners, all you need is a little vinegar or bicarbonate of soda. Fill your bucket to the top with cold water and add a couple of spoons of vinegar (not the fancy stuff) or a couple of scoops of baking soda and leave your solution to rest for 4-5 hours. Congratulations you’ve just performed some science! Why not tweet us your results. Our secret wonder-ingredient can be found in any well stocked kitchen. Vanilla extract has so many uses that it’s a wonder anyone still uses it to cook with. You can use vanilla essence to freshen up your microwave, oven, fridge, or even to sweeten up a smelly house, but our favourite use has always been for cleaning buckets. Just combine a few drops with water and give your bucket a good wipe down, or leave a solution in your bucket overnight and you should have a sweet-smelling container by morning time. Alas, if your smell is so stubborn that none of these tricks work then it might be time to treat yourself. Pick up a new bucket today at buybuckets.co.uk.